The Office of Testing and Assessment serves as a point of contact for anyone seeking information on DBASSE’s current or past work related to testing and assessment or who has an inquiry about future work. It builds on our past studies and activities in this area, which were previously housed under the now-dissolved Board on Testing and Assessment which was active from 1993 to 2018. The Board on Testing and Assessment (BOTA) was originally created to assist policymakers and the public by providing scientific expertise around critical issues of testing and assessment in education and the workplace. The board provided guidance about the technical qualities of tests and assessments and the consequences of their use. The recent work of BOTA included such topics as assessing 21st century skills, evaluating achievement levels for the National Assessment of Educational Progress, and uses of new forms of assessment as tools for both classroom teachers and policymakers. is the point of contact for this office. This short booklet highlights some of the major messages from Board on Testing and Assessment reports. 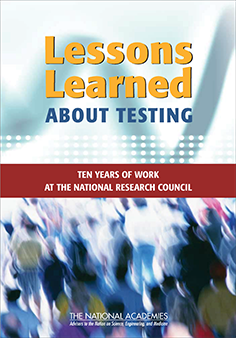 The booklet is geared toward decision makers in education who use large-scale tests, particularly ones that carry high stakes for individuals. Many of these principles also apply to the design and use of tests in other education contexts, such as the kinds of tests teachers use in their classrooms. The lessons are grouped under four broad topics: uses, design, consequences, and public understanding.